Tonight on CBS The Good Wife starring Julianna Margulies continues with an all new Sunday January 31 season 7 episode 13 called, “Judged” and we have your weekly recap below. On tonight’s episode, Alicia (Julianna Margulies) argues against Judge Schakowsky (Christopher McDonald) when she learns that a former bond court client was wrongfully imprisoned. On the last episode, Alicia and Cary joined forces to defend a former client who was facing a multi-million dollar lawsuit over ownership rights to his new music. Meanwhile, Alica’s neighbors threatened her with eviction for operating her firm out of her apartment. Did you watch the last episode? If you missed it, we have a full and detailed recap right here for you. Tonight’s season 7 episode 13 looks like it is going to be great and we’ll be updating it for you beginning 9:00 PM EST. In the meantime, sound off your comments and below and tell us how much you are enjoying this seventh season. 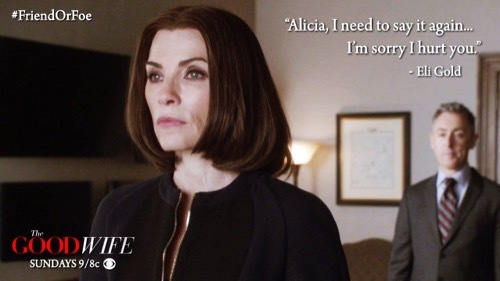 Tonight’s episode of The Good Wife kicks off with Alicia at bail court – Lucca is getting frustrated with her because she isn’t paying attention and keeps zoning out. A prison named Clayton Riggs is brought in, he has been sitting in jail over a disorderly conduct charge. The State’s Attorney asks for another continuance – 2 more months until trial – because they are still trying to locate a witness. That means that Frank will have to sit in jail for another 2 months. While he is in the court room he makes eye contact with Alicia and whispers “Help me” to her. After court Alicia pays Clayton a visit – she has pulled his file and learned that he was in bond court 8 months ago, he has been given 4 different lawyers since then and they keep delaying his court date because they are looking for a witness. Since he was locked up, he has lost his job and his wife. Alicia announces she is going to represent Riggs, his lawyer Bernie is furious that Alicia is stealing his client. Alicia rushes home and tells Lucca about Riggs – she wants to sue the city for unlawfully imprisoning him and destroying his life over a disorderly conduct charge. Lucca laughs that it will never work, the most they can do is try and get his trial date moved up. Alicia announces she is taking on the case pro bono. There’s a knock at the door – it’s Jason, he has returned home, and says he didn’t like his new job. Alicia says she will talk to Lucca about rehiring him. Imogen’s behalf that the school is supposed to “promote tolerance of diverse viewpoints.” They vote to shut down the paper anyways – but Diane tells Imogen that it is not over, they can take their grievances to arbitration. Alicia pays Eli a visit at his office – he is obviously surprised to see her there. Eli begins apologizing about erasing Will Gardiner’s message again. Alicia doesn’t want to hear it – she demands to know what the voicemail said word for word. Eli recites the voicemail word for word, “You know what my plan is? My plan is that I love you. I have always loved you ever since Georgetown.” Eli stops, but Alicia snaps at him and tells him to finish reciting it. Eli says that the only other thing Will said was that he wanted to meet up with her so that they could make a plan. And, Will said at the end of the message that if she didn’t love him, then don’t respond, and things will go right back to usual. Alicia is devastated – that means that Will thought she was ignoring the voicemail and didn’t love him. Alicia heads back to court and bumps in to Judge Schakowsky – he got the paper work and knows Alicia is suing him. He sneers at her that she is committing career suicide, and is out of her mind. Alicia snaps back that she isn’t scared of his threats and cautions hi that she may be recording him. In court – Alicia and Lucca reveal that Schakowsky set Briggs’ bail for $150,000 because he was mad at Alicia that day. The judge rules that if Alicia and Lucca can prove that Schakowsky knowingly violated Briggs’ civil rights (which have been definitely violated) then Schakowsky loses his immunity and can be sued. Diane is still fighting with Illinois Park over the paper. Jason gives Diane a brilliant idea, and a few tips on the case. She wants Jason to come work at her firm full time, he teases Diane and implies that he is interested and tells her to make him a serious offer. Diane heads in to the arbitration meeting and argues that Park has become a “state actor” and offers students its own food, medical services, and even have their own power plant. So, technically they have become their own city within a city – and legally a “state actor” can’t sensor a newspaper. Alicia and Lucca have a bad day in court – the judge listens to Bernie and Schakowsky’s testimonies and then dismisses the case. Afterwards Lucca bumps in to Jason and tells him that she and Alicia need their help with the case. Meanwhile, at her office Alicia gets a visit from Bernie. He announces that Riggs is still suing Schakowsky and he has hired Bernie to handle the case now – Alicia is fired. And, he is also suing Alicia for malpractice. Alicia calls Lucca over and fills her in on the malpractice lawsuit – they’re in serious trouble, they had skimped on their insurance when they went in to business together. Lucca demands to know what is up with Alicia and why she blew off Jason. Alicia has an emotional meltdown and tells Lucca about Will’s voicemail – and how much she has been drinking lately. Lucca comforts Alicia and reassures her that she is her only friend and she has her back – and by having her back she is going to make sure she has the best lawyer to represent her in the malpractice suit … Cary Agos. Alicia heads to court for the malpractice suit with Cary by her side – Bernie argues that Alicia rushed through Briggs’ case in bail court and she didn’t even try to argue his bail because she got nervous and seemed scared of the judge. Judge Schakowsky takes the stand and says that Alicia didn’t do her job on Briggs’ case and didn’t tell him the details of his arrest. After court Cary and Alicia meet with Jason – he has good news, he has recordings of Judge Schakowsky in court threatening to tax the lawyers if they don’t speed up. Afterwards, Alicia apologizes to Jason for acting strange when he got back in to town. He reassures her that he is fine – then Alicia plants a kiss on him in the elevator. After another rough day in court, Eli shows up on Alicia’s doorstep. He shouts at her that he knows he was wrong to delete the voicemail, but she and Will ended up together after the fact – so she can’t hold it against him forever. Eli breaks down in tears and says that he is sorry, and he has “never been more sorry about anything in his life.” Alicia tells Eli that he is forgiven – and then shuts the door in his face. In court the next day Alicia gets bad news – she is going to trial and the motion to be dismissed has been denied. Afterwards, Alicia and Lucca meet with Bernie, he makes them an offer for a settlement of $1.5 Million. He scoffs that if they go to court, he actually could get more because no one likes Alicia or her husband Peter. Alicia heads out for drinks with Cary after her brutal meeting with Bernie – Cary makes Alicia an offer and invites her to come back to the firm, he says the firm will cover her losses in the malpractice suit.